Three weeks later, Fleming sent his boss Admiral John Godfrey, now back in London, a MOST SECRET cable about Donovan’s progress to date as Coordinator of Information. 1) Initial grant of ten million dollars placed at his disposal. 2) Washington personnel will be housed in Library of Congress and New York office will be at No. 2, Wall Street. 3) Skeleton staff should be at work by August 15th. 4) Information from Colonel Donovan will go direct to the President. 5) Emphasis has shifted towards strategical, economic and psychological research work and planning. 6) Propaganda in enemy countries will have a considerable role under ROBERT SHERWOOD, dramatist, working with radio corporations and Federal Communications Committee. 7) Geographical sections containing one naval, one military, one flying officer with civilian experts will be created. They will report to a Joint Intelligence Committee which will include Director of Naval Intelligence, Director of Military Intelligence, State Department. Their sources of information will be Service Intelligence departments supplemented by any fields they may be able to develop. These sections will also nominally repeat nominally be charged with Secret Intelligence Service, Special Operations 1 [propaganda] and Special Operations 2 [active operations] work in their territories. 8 ) Recruits to date include EDGAR MOWRER, journalist, WILLIAM SHIRER, radio commentator in Berlin till recently, DOROTHY THOMPSON, columnist, EDMOND TAYLOR, journalist, and others of this type. Also many able men from industry and commerce and various research workers from Universities. 9) D.N.I. and D.M.I. have become willing collaborators now that the nature of Donovan’s plans have become clear. From being Co-ordinator of Information in June 1941, General William Donovan went on to found and run the Office of Strategic Services in June 1942, six months after the USA had joined the world war against fascism. OSS combined the secret intelligence and sabotage elements of SIS and SOE just as Godfrey and Fleming had suggested and was, as Ian Fleming described it twenty years later, ‘the first true American Secret Service’. In 1947 it would be reconstituted and renamed the Central Intelligence Agency. To show his appreciation for Fleming’s help in June 1941, William Donovan gave Ian Fleming a classic law enforcement firearm, a Colt Police Positive .38 revolver, inscribed ‘For Special Services’. Fleming later boasted to Cornelius Ryan that the gun was his reward for ‘writing the blueprint of the CIA’. Nicholas Rankin spent twenty years broadcasting for BBC World Service where he was Chief Producer, Arts and won two UN awards. 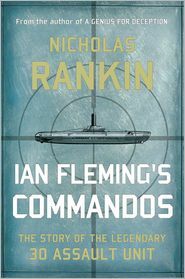 He is the acclaimed author of A Genius for Deception: How Cunning Helped the British Win Two World Wars and Ian Fleming’s Commandos: The Story of the Legendary 30 Assault Unit. Click here for part 1 and part 2 of this series.